A sudden storm has sprung a surprise on Auckland, with barrelling thunder, hundreds of lightning strikes and large hailstones thumping the region on Tuesday. MetService has issued a severe thunderstorm warning for Northland, Auckland, Waikato and the Coromandel. There were 870 lightning strikes recorded across the country between 11am and 4.45pm, with 600 of those in Auckland, from 12.30pm to 2.30pm a MetService spokeswoman said. Earlier today residents were warned to stay indoors if they heard thunder. A large number of lightning strikes prompted Niwa to issue a warning to get off the water. The storm manifested itself in hyper-local pockets, with some Aucklanders not experiencing any of the rain, hail or thunder that struck other parts of the city. 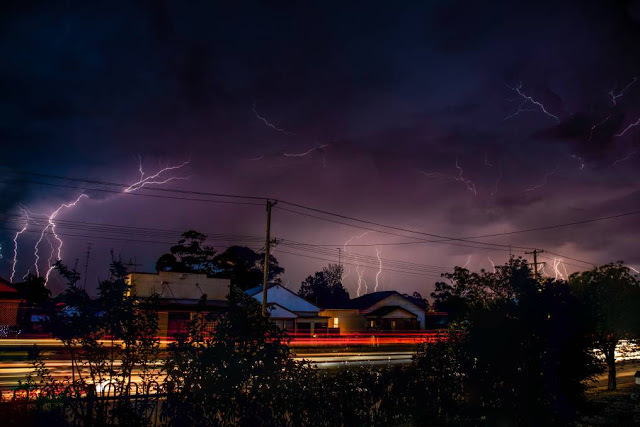 Last week reports of a flash Storm lasting "two intense minutes" devastated an Australian town without warning blowing washing machines and dryers down the street.